Our mushroom season is so short here locally, but often very intense. I feel that with our busy schedules we often miss much (or all) of it. It is especially difficult to find locations suitable to take a large group to find and learn about mushrooms. But many of you out there are seeing them pop up, maybe even going on your own expeditions. So don’t know what kind they are or how to go about further investigation on your own? Call me! We can set up FaceTime or other video conferencing, or a simple call/text and and submission of video or pictures, probably taken from your phone. Best done live in the field, but also possible to do after your foray. When am I available? Off and on, here and there, just like you. If you want to schedule something in advance with me, email me. If you just happen upon mushrooms without a plan or appointment, as often occurs, just email me immediately at feralkevin (at) gmail (dot) com with the subject “Virtual Mushroom Foraging.” If I am available I will send you a PayPal link to purchase a live consultation as described above as well as my phone number. Three options, 15 min, 30 min, 1 hour ($15, $30, and $50 respectively). If you catch me, great, if not, then maybe next time. Tuesdays, Thursdays, Saturdays and Sundays are the best. 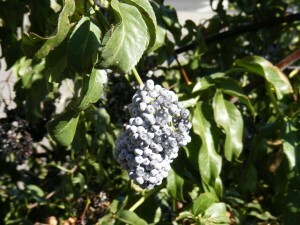 More and more lately I have been “foraging” from my own backyard garden. I spend very little time maintaining it, but this year has been the most productive and successful of any garden I have ever grown. It has been such a blessing, that I realize more and more that everyone should have something like this. 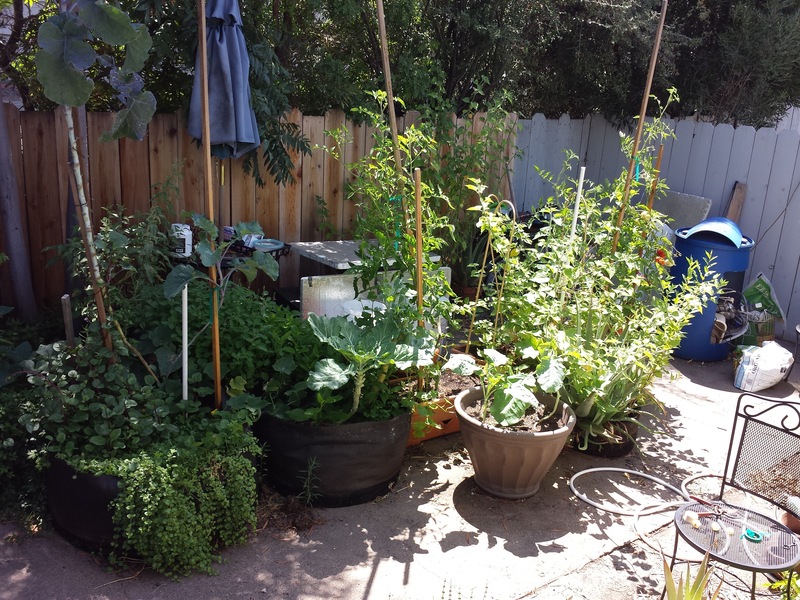 There are so many health and environmental reasons to have a garden even if it’s a small patio garden on concrete like mine. I want to create gardens like I grow for you. Very small scale, intensive, grown with all the tricks and products that I’ve discovered over the years. Perfectly suited for folks that don’t have much if any land. When looking at my backyard, most people (including myself when I first moved in) would think that it isn’t a place to have a garden.) It’s a tiny space, all concrete, with buildings and trees limiting sun exposure. But it can be done, and done well! So I am currently offering 2 different garden installation packages. 45 gallon smart pot and Earthbox (wicking, self watering planter box). Click here to see my prices and plans! I am also offering site analysis, in person and email garden coaching, as well as gardening with kids. Click here to find out more. Lately I’ve been busy not so much foraging, but really enjoying the benefits of gardening and being in the kitchen. I’ve been eating so well this summer from all the fresh ingredients and Lauren’s amazing cooking, that I thought I had to share this with you. Here is just one of the amazing dishes we’ve had that I actually thought to take a picture of and write down what was in it. Of course reading about it doesn’t come anywhere close to actually tasting it. Nor does my not so well taken photograph. So we’re doing a picnic class while the garden is still very active, and of course some foraged foods will be in there, too. 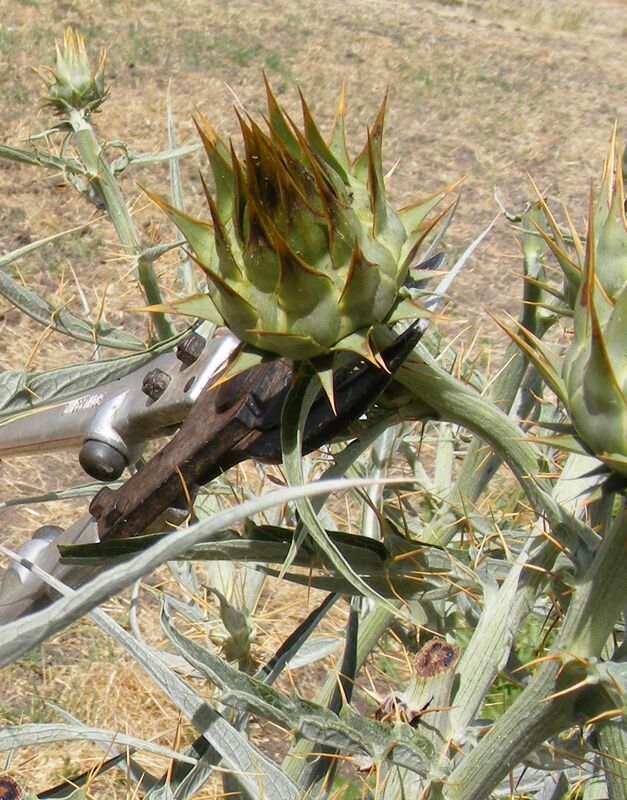 We’ll start the Edible Wild Plant Foray as usual in the open space, learning about what is still growing there in the dry season. 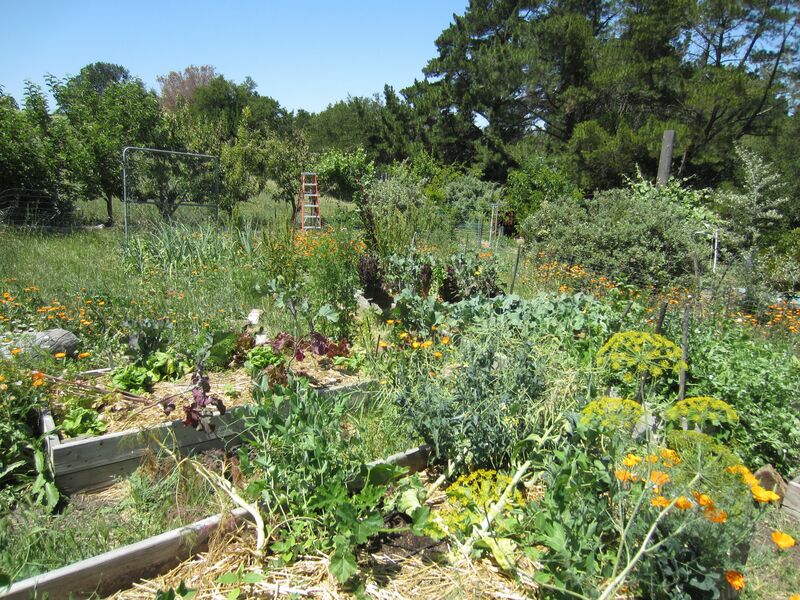 We will then spend the second half of the tour in the large semi-wild, permaculture style, food forest inspired, mega diverse garden! Taste and learn about unusual fruits and veggies, learn about wicking beds and my style of gardening, forage for delicious edible weeds, see the baby chicks and the black soldier fly bin! 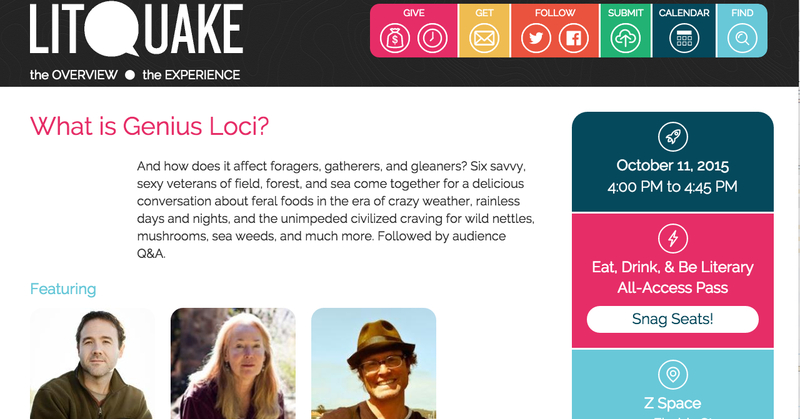 This Sunday, June 14, 2015, from 10 am until noon, I will be offering a 50% sale on my Edible Wild Plant Foray class. When registering through EventBrite, simply add the promotion code: FERAL and receive 50% off the price of the class. 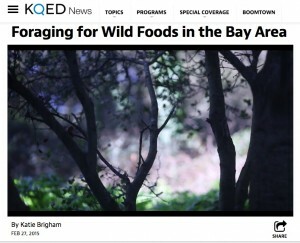 The class promises to be one of the best, with wild artichokes, wild radish pods, mallow cheesewheels, and an assortment of wild plums and other possible fruits! 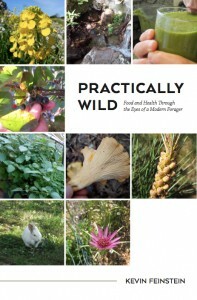 My new book, Practically Wild: Food and Health Through the Eyes of a Modern Forager, has been released! Currently it is only available by ordering here (click “add to cart”) — or in person such as in one my classes or talks. This book has proven difficult for me come up with a concise description of its subject matter. 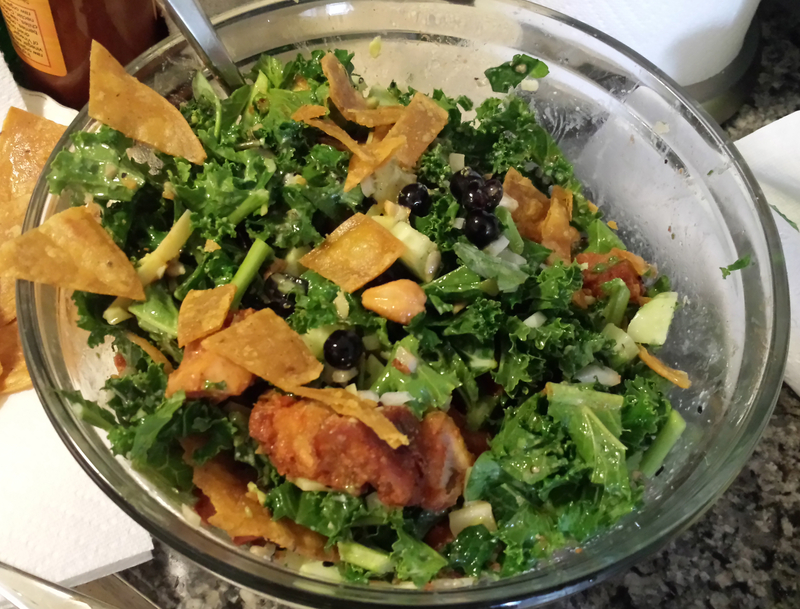 I like to say it’s my 15+ years of research into food and health. It’s a deliberate hodge podge — its subject matter is very broad. It’s stuff that I think we all should know as humans on planet Earth today. When I started my journey over 15 years ago, I was just finding out how we were doing everything catastrophically wrong in regards to food, health, and the environment. After having digested that and my life changed forever, I realized that what I needed to figure out was how to do it the right way. 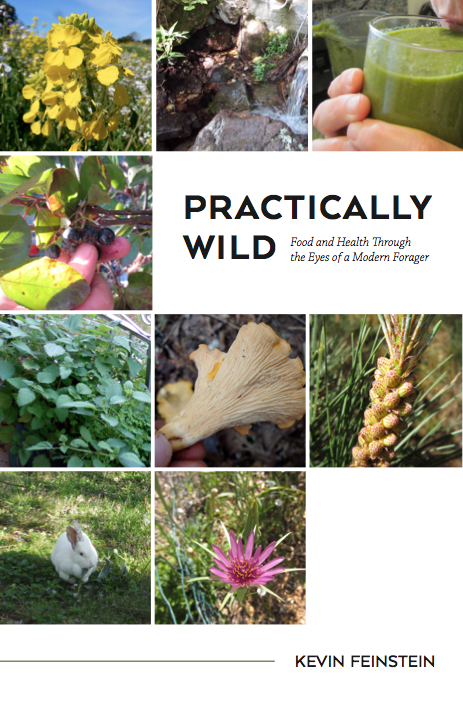 So Practically Wild is that research essentially distilled into a need-to-know, easy to understand format so that everyone may share in the knowledge I’ve gained about these subjects. If we realize that our global culture is doing it way wrong, which is widely understood by now, this book is my attempt to show us how to do it right, based on my experience, observations, and ongoing research. Kickstarter only has 13 days to go! It’s spring and there is so much potential. It is my favorite time of year. 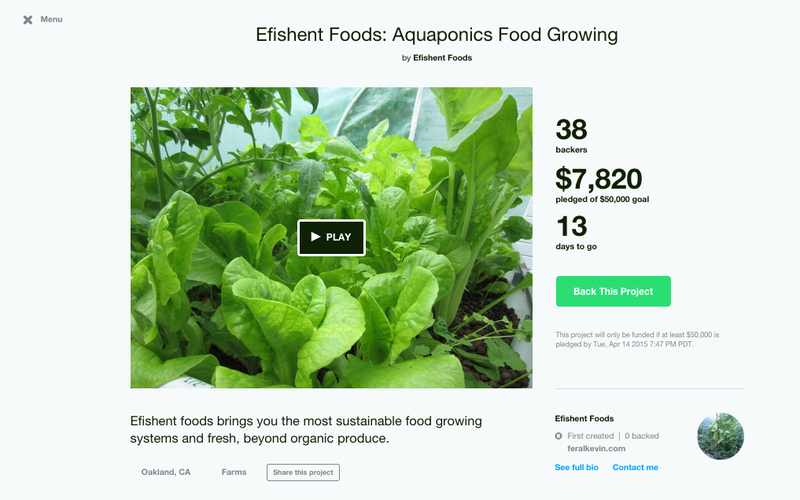 And although Efishent Foods will grow year round in a Bay Area greenhouse, and have produce available all year, — even some tropical and warm season plants in the winter! — spring still is important to get started on a project like this. The summer simply has more sun and that is why for us it’s still “the growing season.” We launched our Kickstarter campaign for this very reason when we did. We really want to get growing as soon as possible –it’s April and we don’t want to miss our window. We only have 12 days left and we still have a long way to go. We can’t do it without your help! Please contribute or spread the word!